The well-known manufacturer of audio, video, communications and information technology products for the global consumer and professional markets, Sony has expanded its innovative WALKMAN line of digital media players with the high-performance, easy-to-use WALKMAN NWZ-A820 series, including NWZ-A829 (16GB), NWZ-A828 (8GB) and NWZ-A826 (4GB). The new Walkman featuring the clear, bright 2.4-inch QVGA screen display for high quality 30fps (frames per second) video playback and bluetooth connectivity for wireless music enjoyment. 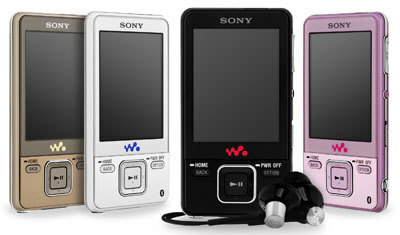 The newly revealed Sony Walkman NWZ-A820 Series portable media player which available in a choice of four colour variations including black, silver, gold, and pink will hit the market from April 2008. According to the company, all of them can support up to 10 hours battery life for video or a whopping 36 hours for music playback. Even with Bluetooth stereo enabled, playback stretches to 7 hours of video or 15 hours of music.